Mangosteen and its beneficial properties. An enormous amount of modern study and research has been channeled toward unlocking the secrets of this remarkable fruit. In fact, scientists have actually identified the major compounds found in the Mangosteen that are responsible for its healthful characteristics. These days, everybody knows about free radicals and antioxidants. Free radicals attack the cells in our bodies every second of every day, and antioxidants work to the repair the damage. But did you know that there exists an antioxidant that is even more powerful than any vitamin? This powerful, life-enhancing substance is called Xanthone. In fact, there is a whole family of Xanthones, and the most dynamic of these are found in the amazing whole fruit Mangosteen. While most people know about the antioxidant benefits of Vitamins C and E, far fewer are aware of the incredibly potent antioxidant power of Xanthones. Xanthones are natural chemical substances that have recently won high praise from numerous scientists and researchers. Xanthones have been studied for their medicinal potential, since they demonstrate a number of pharmaceutical properties. Xanthones have been the subject of intense research for several decades. They are found in a select number of rain forest plants, but nowhere are they found in more abundance that in the pericarp, or rind, of the Mangosteen fruit. This smooth, purple covering that was ground with ancient mortars and used to heal infection turns out to be the MOTHERLODE of beneficial Xanthones. 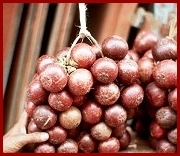 The two most beneficial Xanthones found in the Mangosteen have been named Alpha Mangostin and Gamma Mangostin. When isolated and thoroughly tested by researchers, these two Xanthones have been found to carry a host of benefits. According to professional journals such as Free Radical Research, Journal of Pharmacology, and the Indian Journal of Experimental Biology, these Xanthones have a remarkable effect on cardiovascular health; are naturally antibiotic, antiviral, and anti-inflammatory; and are some of the most powerful antioxidants to be found in nature.